Not sure how to reply to that email about your upcoming class reunion from Karen? Don’t worry your pretty little head, Google has apparently has the answer: the tech company has rolled out a “smart reply” service for Gmail that provides users with a set of predetermined, quick replies. Google announced the new service – already available through the “Inbox” app – on Tuesday, aiming to save users a few seconds when it comes to crafting email replies. 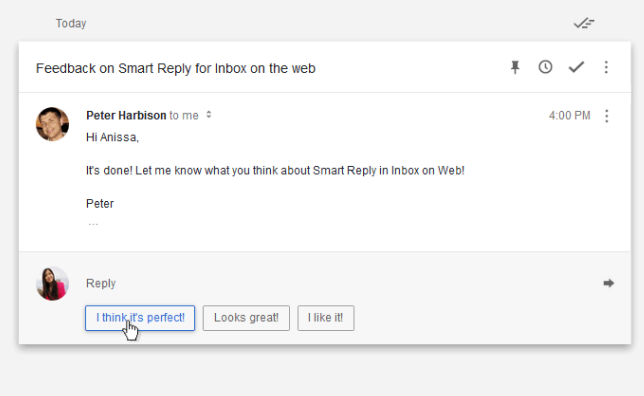 Smart Reply offers Gmail users up to three responses based on the email they receive. Selecting one of the options will start a reply that you can either edit or send right away. Replies will start simple, with option like “thank you,” but over time, the feature learns to provide more complicated responses based on your own emails. The tech company says that it decided to roll out the service to its web version of Inbox after noticing that 10% of all replies on mobile devices use Smart Reply.